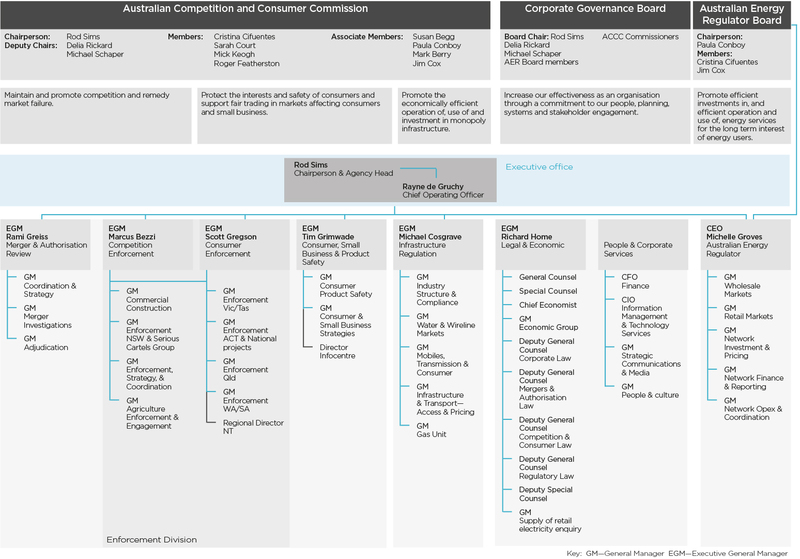 The Australian Competition and Consumer Commission is an independent Commonwealth statutory authority whose role is to enforce the Competition and Consumer Act 2010 and a range of additional legislation, promoting competition and fair trading, and regulating national infrastructure for the benefit of all Australians. The Commission comprises six full-time members, including the chair, two deputy chairs, and three members and one part-time member. Full-time members are appointed by the Governor-General for terms of up to five years and appointments are made after the majority of state and territory jurisdictions support the selection. The Australian Energy Regulator is Australia’s national energy market regulator. The AER’s functions are set out in national energy market legislation and rules, and mostly relate to electricity and gas markets in eastern and southern Australia. The AER has its own independent Board, with one Commonwealth member and two state/territory members, any one of whom may be appointed as the chair. It is supported by staff who are engaged exclusively on energy matters and has access to the ACCC’s specialist legal and economic staff. ACCC Commissioners and AER Board members are statutory officers. The staff forms part of the Australian Public Service (APS). Both agencies are within the Treasury portfolio. The responsible minister was the Treasurer, the Hon. Scott Morrison MP. The Hon. Michael McCormack MP, Minister for Small Business had responsibility for Australian Consumer Law policy. driving efficient infrastructure through industry-specific regulation and access regimes. monitoring networks and wholesale and retail energy markets to ensure businesses comply with the legislation and rules, and taking enforcement action where necessary. The Australian Government has issued a Statement of Expectations for the ACCC, which outlines its expectations of the ACCC’s role and responsibilities, its relationship with the Government, the responsible Minister and the Commonwealth Treasury, issues of transparency and accountability, and organisational governance and financial management. In it, the Government states it is imperative that the ACCC act independently and objectively in performing its functions and exercising its powers as set out in the Competition and Consumer Act 2010. The Government’s vision is for the ACCC to be a high performing and responsive agency that administers a principles-based regulatory framework. The Statement of Expectations is available via the ACCC website. The ACCC provides a Statement of Intent responding to the Government’s Statement of Expectations for the ACCC. undertaking an inquiry into the supply of residential insurance building, contents and strata insurance products to consumers in Northern Australia and will monitor prices, costs and profits to address concerns about the high price of insurance in the region. The AER reports to the Council of Australian Government Energy Council (COAG) which is responsible for pursuing priority issues of national significance and key reforms in the energy and resources sectors. COAG expects the AER to perform its functions as defined in the Competition and Consumer Act and in accordance with all relevant legislative requirements and agreements. To strengthen accountability and performance frameworks, the COAG Energy Council in 2014 developed a Statement of Expectations for the AER. The AER’s Statement of Intent (http://www.aer.gov.au/publications/corporate-documents) sets out the AER’s work program in regulating energy networks and markets, and benchmarks that will measure its performance. The Statement also sets out how it aims to achieve principles of accountability and transparency, efficient regulation and effective engagement with stakeholders and other energy market bodies. In addition to administering the Competition and Consumer Act, the ACCC has responsibilities under many other Acts and Rules, as does the AER. These are outlined in appendix 6 on page 296. The ACCC’s purpose is to make markets work for consumers now and in the future. The ACCC works to enhance the welfare of the Australian community by fostering competitive, efficient, fair and informed Australian markets. Its aim is to bring greater competitiveness and fair trading to the Australian economy, working on the fundamental principle that this benefits consumers, business and the wider community. The AER works to promote efficient investment in, and efficient operation and use of, energy services in the long-term interests of consumers with respect to price, quality, safety, reliability and security of supply. It does this through setting revenues that the network businesses can recover from consumers based on its assessment of efficient costs, ensuring wholesale energy markets operate competitively, and by educating and protecting consumers. Independent: We pursue the interests of the Australian community, objectively and transparently. Expert: We make timely decisions based on evidence and rigorous analysis. Strategic: We make best use of our resources by taking considered and targeted action. Trustworthy: We communicate honestly and directly and act respectfully. The ACCC is a government organisation that enforces the Competition and Consumer Act and other legislation, but, as an independent statutory authority, it acts independently of government. The AER operates within the same business model. The Competition and Consumer Act and other legislation require the ACCC and AER to protect consumers, encourage competition and regulate certain industries. The ACCC and AER apply the law without fear or favour, to achieve universal compliance. As well as enforcing the law, the ACCC and AER provide information to educate businesses and consumers about the laws they administer to encourage more effective voluntary compliance. ACCC decisions are made through formal meetings of the Commission. Only the Commission itself can decide to start court action, oppose a major merger proposal or authorise anti-competitive behaviour where there is sufficient public benefit. AER decisions are made through formal meetings of the AER Board. Both the Commission and the AER Board may delegate certain other decisions and powers to Commissioners, members or senior staff. Outcome: Lawful competition, consumer protection, and regulated infrastructure markets and services through regulation, including enforcement, education, price monitoring and determining the terms of access to infrastructure services. Program 1.1: Australian Competition and Consumer Commission. Program 1.2: Australian Energy Regulator. The details of the ACCC and AER strategies, deliverables and performance indicators are listed in our Annual Performance Statement (page 23 to 204). Callers who are deaf or have a hearing or speech impairment can contact the ACCC through the National Relay Service: telephone 13 3677 or visit the website www.relayservice.gov.au.